who is staring oddly at her fresh, red-colored, cylinder-shaped Play-Doh. really struggling with a decision. with your tongue? Mmmmmm, salty isn't it?" And then forcefully, "Go ahead, eat it! Look at the label, Non-Toxic! It can't hurt you!" 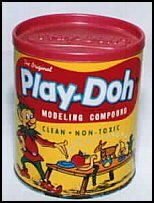 Play-Doh needs no introduction, which is why a fictitious one will suffice. shape) and, yes, even eating it, for more than 40 years. molding sets in stores today, and it smells (and tastes?) just like you remember! By the way, I never tried it, but if I had, I would have eaten the white dough.